Based on the book that inspired the movie The Thing, Who Goes There by Certifiable Studios drops you into the shoes of a science team at a remote arctic outpost that have uncovered something sinister and otherworldly. You have discovered an alien lifeform, but it’s idea of friendship is…not exactly to your liking. You seek to contact the outside world and let them know of this danger but an impending storm has blocked communication. As you hunker down in your base waiting evac on a helicopter, you must constantly fight off the dangers of the wild as well as the Thing’s attacks. If that weren’t enough, it’s possible that one or more of your crewmates will become infected and seek to silence your attempts to warn the rest of the world. Who Goes There makes you constantly question who is friend and who is foe. In Who Goes There the main goal is to survive 3 days and escape on the helicopter on it’s way to rescue you. It’s a simple goal, but far from easy: your team must collectively exceed a certain score total to actually escape and win the game. On top of that, Infected players also want to jump on the helicopter. Their efforts will make it harder for the uninfected team members to reach their goal which creates a fantastic theater for all manner of chaos. This is one of the few games where the “evil” side’s goal is exactly the same as the “good” side’s. It becomes incredibly difficult to determine who is ally and who is infected as everyone attempts to sell themselves as your BFF. The end of game can become a swirling chaos as the group determines who to let on the helicopter and who to force to stay behind. One wrong decision can be the difference between sweet victory and crushing defeat. Who Goes There is played over the course of 3 “days” that are broken into a series of rounds. On each round all players must overcome a new “event” that has befallen the camp as well as face the dangers outside in an effort to find the most valuable resource in the game, Helicopter bonuses. These bonuses can be the difference between scraping by in victory and falling short in defeat. At the end of each day there are two special rounds that involve eating canned food and then sleeping. It is imperative that you prepare for these rounds, as failing to meet the requirements for either round will make you vulnerable and increase your chances of getting infected. These two rounds create the most stress in the game; forcing players into uncomfortable situations where they have to choose between the lesser of two terrible options. The food round is first, and it requires each player to spend a canned food item from their hand or draw a vulnerable card. Some players have access to a good amount of canned food, but most only have 2 in their entire personal supply. Since there are 3 rounds requiring food, players will have to spend a great deal of time looting, rely on characters that have more food, or be forced to go without. The scavenging and bargaining that ensues creates some of the moments that make this game great. Directly after the food round is the sleep round. At the start of this round, players must choose who to “bunk” with. If a player chooses, or is forced, to sleep alone they must draw a vulnerable card further increasing their chance of being infected and reducing their credibility at the table. You may question why you would ever sleep alone; the catch is that if you do bunk with another player and they have any vulnerable cards they must reveal to you their infection clicker. 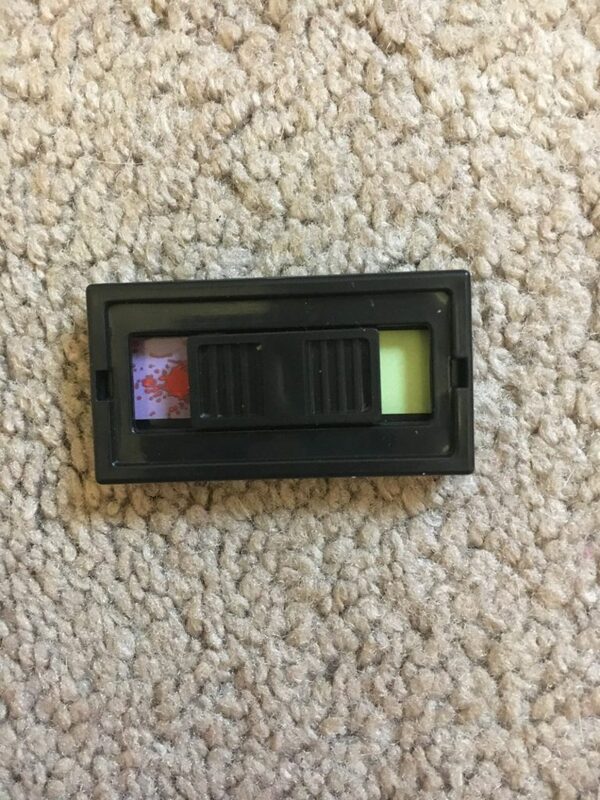 This fun little device has a green side for clean and a blood stain for infected. A human player must always show the green side but an infected player may choose to show green or infected. If the infected side is revealed, then the infection is spread to the other player. This situation causes you make uncomfortable choices: if you are the player with the most vulnerable cards players may not want to bunk with you for fear of who you are. Who Goes There has a real knack for forcing players to make impossible choices. The rounds flow smoothly as a player’s turn is very well laid out. Each player must overcome the hardship the camp faced that round then perform actions to prepare for the coming days. 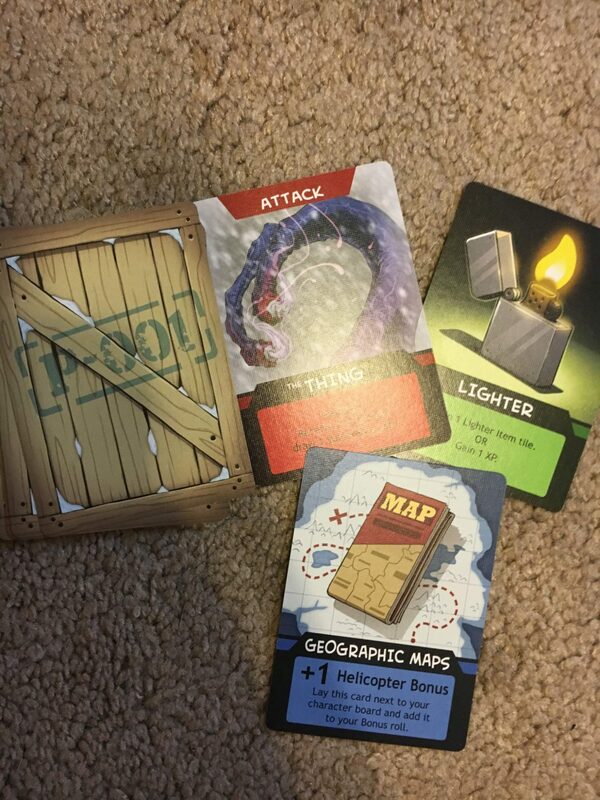 Players begin with 5 action cubes that they spend in varying amounts to perform actions from searching different location decks to making repairs on the camp’s door or boiler room. While we are on the subject of characters, one of the things that I love about this game are the asymmetrical characters. Each character has a very different feel and playstyle. This flavor is beautifully displayed through the variations on their player boards as well as their personal deck of cards. These cards offer unique advantages and flavor to the character whose role you are assuming. In Who Goes There you assume the role of a certain crew member that has a personality and role on the team. You can strengthen your attributes in a variety of ways from gaining another action cube to unlocking more inventory space. This is done by spending XP. The primary way to find XP is by searching outside, which drains your stamina and puts you at risk of attacks from the Thing. Each character in the game has a specialized role on the team. This flavor and skill set is most felt in their character deck of cards. 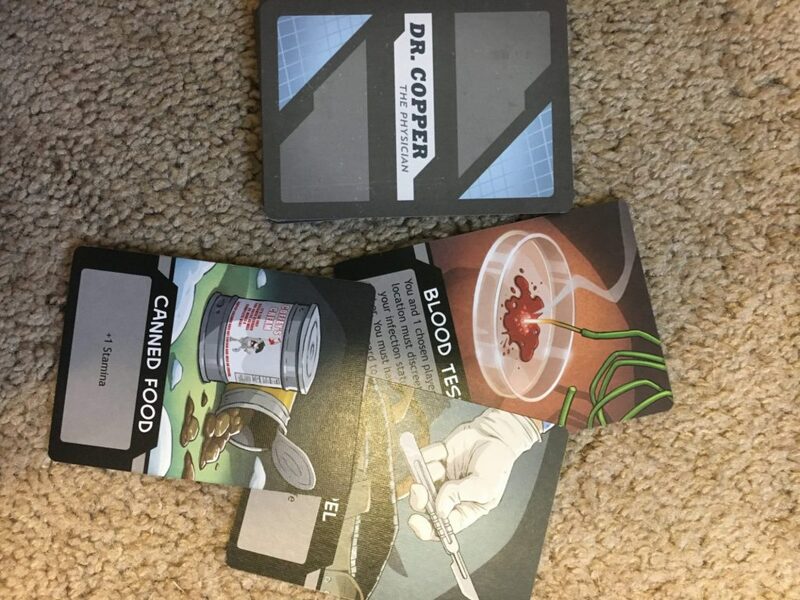 If you play the doctor, you will find medkits and valuable supplies in your deck. You even have access to a special test to determine if someone is infected or not. While your healing skills are top notch, you will be at a loss for crafting supplies or food for yourself. Conversely, if you were to play the cook you would find a plethora of food but find yourself needing to rely on others for help if you get wounded. The way in which your characters vary adds a great deal of replayability and codependency, which makes Who Goes There exceptional. You are forced to rely on others whose strengths are better suited for tasks since you are literally unable to do everything yourself. This pressure makes for some tense decisions as the infected players will also seek to leverage their skill set to sell themselves, lower your defenses, and infect you if you are not careful. One of the most intriguing aspects of Who Goes There is the method in which players get infected or spread infection. 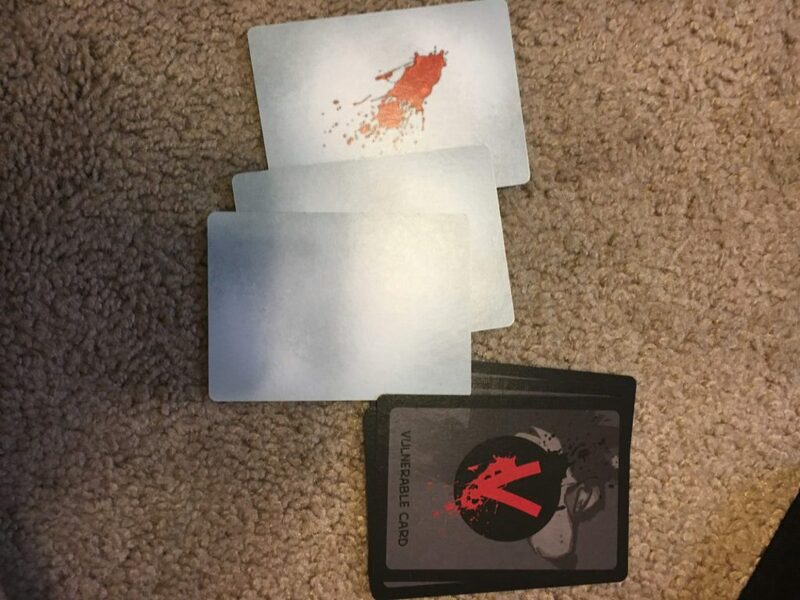 The initial infection is only found on 1 of the 12 vulnerable cards . After a player gains a vulnerable card, infected or not, a new layer to the game opens up. Every trade, or bunking interaction with a player with 1 or more vulnerable cards now forces players to share their infection clicker with the other player. Remember, Human players must show green while infected players have the choice to trick other players by showing green or gain a friend by infecting more players. At this point you may wonder how in the world you could even win this lopsided game where it seems so easy to get infected. This is where the creative minds that crafted Who Goes There really got the social dynamics formula right; the game is balanced in a beautiful way. While both infected players and humans want to get on the helicopter, humans don’t want infected to board but the infected players must to have at least one human get on the helicopter or they lose. This rule makes it incredibly dangerous to over infect the board because if the lone human player dies for any reason, the infected lose the game. 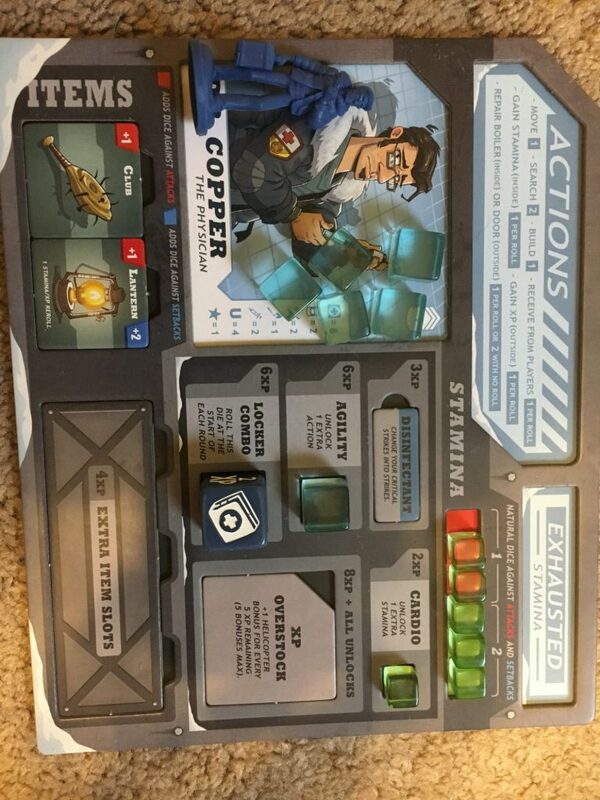 This forces the infected to be very cautious about who and when they infect.This mechanic and the final scoring system implemented in this game pushes players together in a dynamic way whether they like it or not which has created some amazing “AHA!” moments at the final reveal at the end of the game. Beyond the fantastic rule set and balancing that makes Who Goes There great, the polish does not stop there. Who Goes there is beautiful! From the components to the art, that is somehow equal parts light and gory, Who Goes There is shiny and alluring from moment one. While some might find the game overproduced or flashy, I find that the quality across the board (literally) creates the immersive and tense theme that you need to make a hidden motive game like this great. You can feel the passion and love the team at Certifiable pumped into this project and all I can say is “well done”. 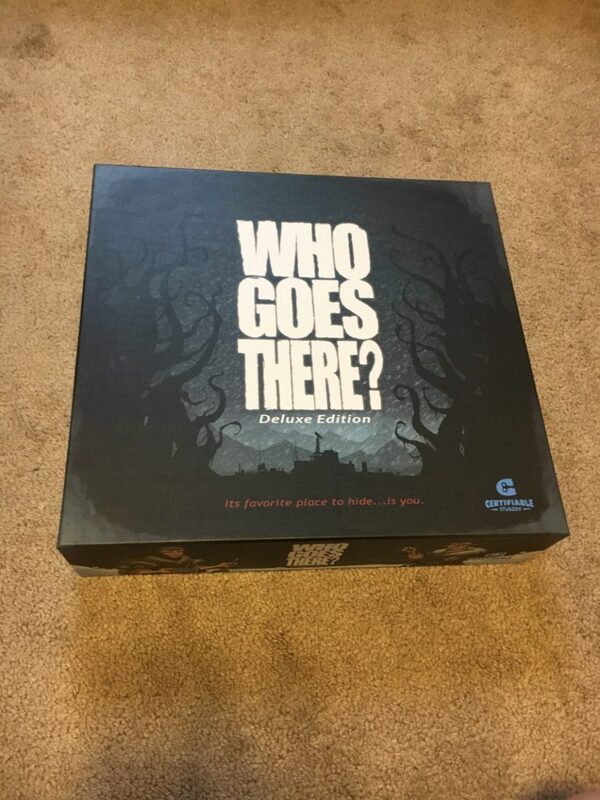 Who Goes There is a tense and immersive game that allows you to experience the suspense and horror of The Thing all from the warm comfort of your home. 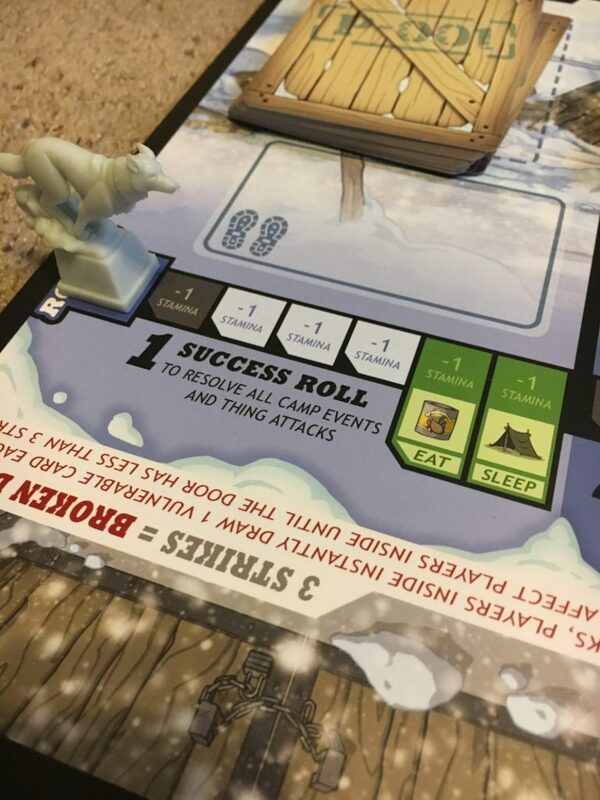 It is gorgeously crafted and places just enough control in your hands to make the games not feel like good or bad luck while still not making survival easy by any stretch. The board is well crafted so you are not bogged down wasting your time navigating a complex system. You are able to jump right into meaningful actions that flow quickly. The most difficult thing to explain in the game is the end of game scoring system, basically a math problem. 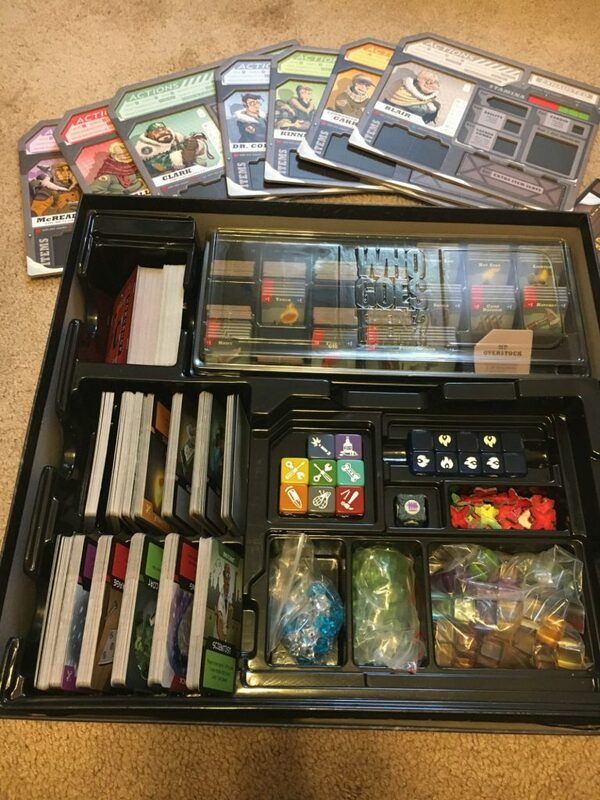 It’s a great system as I believe it balances the game well but it is cumbersome and a new player may have great difficulty understanding it. That is truly the only “negative” comment I have about Who Goes There. The scoring system works as it makes the game close every time but it often become an algebra class when attempting to explain it to someone who has not seen it played out. All in all Who Goes There is a blast from the past that gives great homage to one of my favorite old movies. If you enjoy social dynamics, hidden traitors, or giving your crewmate literal screws when he asked for a medkit just so you can infect him; then give Who Goes There a try. You will not be dissapointed. Rating: 8/10 This is my new Shadows Over Camelot! I am very anxious to try this in order to compare and contrast it with The Thing Infection at Outpost 31.